My first impressions were okay, looks like every other shiny new airport now. I’ve flown into Changi (Singapore) when it was new, and Chek Lap Kok when it replaced Kai Tak’s thrill ride (Hong Kong). There’s a certain new-airport vibe. Long corridors, new carpet, pristine walls, oversized architecture. Mentally comparing it with the little old airport I’d become accustomed to, I started tallying the Good, the Bad, and the Mucked Up. The bathrooms! Finally, clean, world-class bathrooms. As a concession to Indian toilet hygiene, they have water available for ablutions. They had attendants who kept an eye on the place and cleaned up at intervals, something unnecessary in most countries but a very nice amenity in a nation where some percentage of travelers are not accustomed to Western-style toilets. Bright and light. The corridors are broad, the colors reasonable (white with reds and yellows), and most of the travelators working. Not crowded. It may have been the times I landed and left, or it may be the size of the place. It wasn’t at all crowded. Oh what a trek! One of my complaints about modern airports is the long distances one must walk. Travelators (moving walkways) help; but this airport has long stretches that lack them. I departed from Gate # 13, and it compares with the worst of Heathrow (London). Once you arrive there, you’re in a barren wilderness of carpet and you don’t feel like hiking all the way back to where you might find coffee or a snack or books. Thank heavens for my Kindle… and those vending machines! Gate #14 (opposite Gate #13) is as bad. If your flight leaves from either one, factor in 30-40 minutes extra. I saw a just- married couple galloping down the corridor, her henna-stained hand in his, while he tried to urge her along without her twisting her golden-high-heeled ankles… I hope they made their flight. The shops. I fondly recall a small but wonderful little jewelry store at the old airport, which sold silver-and-semi-precious-stone pendants, necklaces, bracelets and ear-rings in creative Indian designs. There were a few other handicraft-type shops, selling silk scarves and Indian clothing. All of them were pretty busy. The shops in this airport are the typical glitzy big-Western-brands, and they were empty. One little kiosk (called Kala Yatra, if I recall correctly) was crowded: It had the Indian style jewelry and scarves, though not the selection and quality that the old shops at the old airport had. The art. Initially, I was pleasantly surprised. 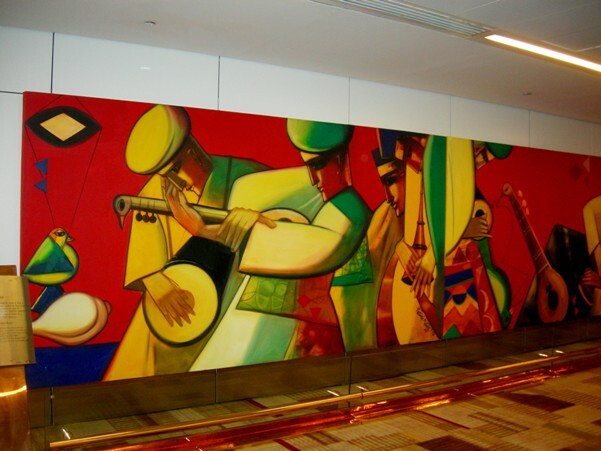 The old airport had a wonderful frieze by Hussain, and I’d sort of hoped it had been preserved. If it was, I didn’t see it. But they had some great new paintings by Paresh Maity in welcoming shades of red. When I went downstairs, though, I was accosted by a huge display of hands in various mudras (hand signs). The gigantic hands were silvery plastic — or so it seemed — and were mounted on a background of copper-colored discs. It looked like the worst of 1960s public decor. Later, I saw similar over-sized sculptural artifacts elsewhere in the airport. This is *so* not the best India has to offer. Someone help! Missing personnel. So my flight from Bangalore arrived in Delhi at 10.30 p.m. It was crowded; many people were morning/ evening commuters. It took a while to get off the flight, but eventually we all deplaned, hurried down the passenger walkway… into a dead end. The door was locked. The person who was supposed to open it wasn’t there, gone for a coffee or something. We waited. Eventually, someone walked back to the plane and told the staff, and perhaps they radio’d someone, I don’t know. Anyway, they eventually let us out, after a 10-15 minute wait. “This happens regularly,” said one of the commuters. He sounded experienced. Software snags. More seriously, they haven’t got all the bugs out of the air traffic control system, which has had technical glitches for some months now. It wasn’t reassuring to read, the day before I traveled, this headline: Ten tense minutes that tested Delhi ATC. The article that followed blithely assured us that in January, the Flight Data Processing System had gone down and air traffic controllers had taken over, guiding flights manually. 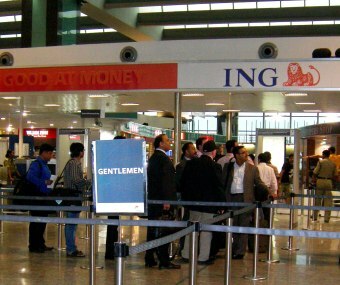 “We are handling close to 750 flights at IGI Airport every day and definitely need a more reliable system,” the article quoted an official as saying. I'm an international Business Consultant; author of a book called India Business Checklists, and working on a book on doing business in Burma. This entry was posted in Communications, Infrastructure and tagged airports, Doing Business in India, India's infrastructure. Bookmark the permalink. 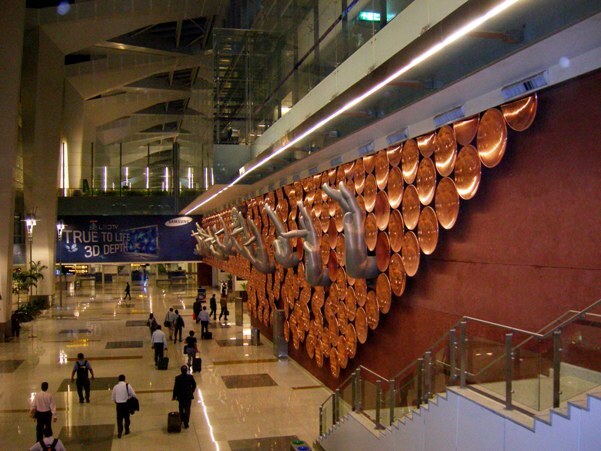 When I flew out of Delhi last September a few weeks after the new international airport opened and just before the big games started, the Immigration and Customs chap was a piece of work. For each passenger he took his pen out of his pocket, made a deliberate show of unscrewing the cap, methodically processing the paperwork and stamping the passport. Then he carefully screwed the cap back on the pen, returned it to his pocket and repeated the entire rigmarole for the next passenger. Twice he decided that his computer was acting up, and called a technical support chap who came, and presumably rebooted the hapless PC. Meanwhile, all the other lines were zipping by. I was starting to get concerned about catching my plane. I hoped in vain for someone to come out and wring his neck – or at least shift the waiting passengers to another line, but no such luck. On the other hand, when I flew out of Chennai in December, the bureaucracy was the epitome of efficiency and courtesy, even if the airport was a bit run down. 2014 India Corruption: Modi Effect? Was I Chatting with a Bank of America Robot?